Canada's arenas consumed 17.2 million gigajoules (GJ) of energy in 2014. In all, there were 2,183 arenas in Canada, classified into three arena types based on their building characteristics. The arena types included stand-alone single rinks; stand-alone multi-rinks; and multiplex sports complexes and professional sports venues. Together, Canada's arenas accounted for 11.8 million square metres (m2) of floor area. On average, the energy intensity of arenas was 1.46 gigajoules of energy consumed per square metre of total floor area (GJ/m2). Stand-alone single rink arenas represented over half (52.0%) of all arenas, accounting for 31.0% of total floor space. Multiplex sports complexes and professional sports venues, which represented 37.4% of all arenas, accounted for 53.6% of the floor space. Regionally, Ontario had close to one-third (32.5%) of all arenas in Canada. By arena type, Ontario had the highest share of stand-alone single rink arenas (30.1%) and stand-alone multi-rink arenas (43.1%) of any region. The Prairies region had the highest share of multiplex sports complexes and professional sports venues (34.6%) and the second highest share of stand-alone single rink arenas (30.9%) among the regions. In contrast, British Columbia and the territories had the lowest share for all arena types (9.4%) and the lowest share of stand-alone single rink arenas (6.3%). The Atlantic region had the lowest share of both stand-alone multi-rink arenas (7.3%) and multiplex sports complexes and professional sports venues (7.8%). Stand-alone single rink arenas were the most common arena type in every region except for British Columbia and the territories (35.1%), where multiplex sports complexes and professional sports venues held that distinction (53.2%). Multiplex sports complexes and professional sports venues accounted for the largest proportion of total floor area within every Canadian region except Quebec, where stand-alone single rinks represented the highest share of total floor area (47.2%). Overall, arenas in Ontario accounted for 39.6% of total energy consumption, representing the highest energy consumption by each arena facility type. Ontario arenas (1.64 GJ/m2) reported the highest regional energy intensity. Arenas in the Atlantic region (5.7%) consumed the lowest share of total energy and recorded the lowest energy consumption for each arena facility type, except for stand-alone single rink arenas. Atlantic arenas reported the lowest regional energy intensity (0.97 GJ/m2). British Columbia and the territories accounted for the lowest share of energy consumption among stand-alone single rink arenas (6.2%). Nationally, the multiplex sports complexes and professional sports venues were the largest consumers of energy of any arena facility type at 58.2%. This arena facility type had the highest energy consumption in four of the five regions. 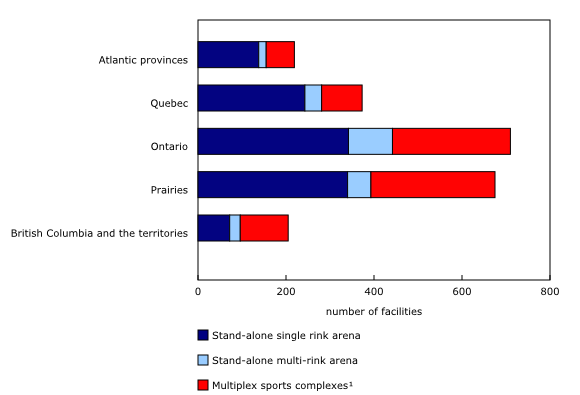 In Quebec, the arena type consuming the most energy was stand-alone single rinks at 45.1%. While accounting for the smallest share of arenas in Canada and occupying the least amount of total floor area, stand-alone multi-rink arenas had the highest energy intensity levels of any arena facility type at 1.62 GJ/m2. In contrast, stand-alone single rink arenas had the lowest energy intensities with 1.16 GJ/m2. The 2014 Survey of Energy Consumption of Arenas was designed to collect data on the floor space of, and the energy consumed by, Canadian arenas. To be in scope for the survey, arenas must have had at least one indoor rink in operation in 2014 and must not have been located in a shopping mall, school or university. While arenas were selected and sampled from four arena-type groupings based on building characteristics, data were aggregated to protect the confidentiality of sensitive statistical information. Data for the two groups, multiplex sports complexes or recreation centres, and professional sports or entertainment arena venues, were combined and are referenced within the text as multiplex sports complexes and professional sports venues. Sports multiplex: at least one indoor ice surface used for skating or ice hockey, with other sports infrastructure, such as pools, curling rinks, gymnasiums, etc. Professional sports / entertainment venue: arenas/facilities with at least one indoor ice surface used by professional or semi-professional hockey teams, and/or entertainment venues. Gigajoules: A unit of measure for energy consumption equal to one billion joules. Six gigajoules are roughly equivalent to the amount of potential energy in one US standard barrel of oil when consumed. Energy intensity: The total amount of energy consumed (expressed in gigajoules) divided by total floor area (expressed in square metres). Higher energy use per square metre of floor space is considered more energy intensive. To enquire about energy consumption by arenas, contact Marie-Lyne Tremblay (343-292-6382; marielyne.tremblay@canada.ca), Natural Resources Canada.